It is difficult to put yesterday into words. It was a day full of activity but, more than that, it was a day full of emotions. There were many tears and much, much love. It was a day to be remembered. Our day started as usual. We had breakfast at the hotel and then went straight to the church to continue work on the church project. Our work yesterday consisted of taking all of the dirt that we had taken out of the holes in the ground at the beginning of the week and refilling the holes with the dirt about 6-8 inches at a time. As the dirt was poured in by wheelbarrow, a handmade cement tool was used by the team members to pound the dirt into the ground to get it as compact as possible. The cement block used to tamp down the dirt was about a foot square and weighed about twenty-five pounds. That doesn’t sound like it would be difficult but the point is not just to lift up the cement square and drop it. The point is to use as much force as possible to pound the dirt into the ground. When one person lifts up and pounds down twenty-five pounds, hundreds of times in a row, it is exhausting. I went and asked Jim to make a phone call for me to the bus driver at one moment yesterday and his hands were shaking so badly that he couldn’t dial the number. It was hard, strenuous work. Beyond the shoveling and the tamping into the holes, the dirt that was not used to fill the holes had to be shoveled into wheel-barrows and moved out to the street where large trucks came and workers removed it by hand. We saw one man spending hours and hours shoveling and removing all of the debris we had moved to the street, one shovel-full at a time into the bed of a truck. We certainly couldn’t complain about the work we were doing when we saw how hard he worked. One of the most glorious parts of the day was that we finally hit the 70 degree mark here in Santa Cruz. We had yet to break into the seventies this week with the weather and we actually saw a few moments of sunshine. It was like a kiss from heaven feeling that sunshine on our faces but it also meant that the team was hotter doing the hard labor. The weather has been cold here but it has been perfect for working each day. We have been very grateful for good work weather while we were here. While the majority of the team worked on the church site, Kisha worked hard doing all that she does best. She has been such a gift to us on this trip. She is extremely good at what she does and she captures photos and videos of people that catch the heart of all that we do here. We are so glad she is with us. Elsie and Karina took some time to organize our medical supplies left over from our clinic days. We have all the supplies cataloged and saved for next year. We spent some time cleaning our ground zero room where we kept our supplies and our work equipment. After a week of muddy, dusty clothes and boots, it was a chore to get the white tile floors swept and mopped. We worked throughout the day. We had a lovely last lunch made by Maribel and eventually finished up our work and went back to the hotel to get showered before we left for dinner. Tonight’s dinner was exceptionally special. The pastor invited our team and several of the family members from the church out to the clubhouse of his neighborhood where the church treated us to an amazing dinner they had cooked for us. It was so delicious but, more than that, it felt take a family meal. Mark even stated that it felt like Thanksgiving dinner. It felt like every family member had come together to break bread. Even though some of the people didn’t understand one another, we were knit together in the heart and it was a precious, special time sharing that meal. As the dinner began, one of the young adults played a video he had made for us with pictures from all of our trips down to their church. It was emotional as we saw what had been accomplished over the last three years. The church is transformed but, more than that, relationships had been established that will last a lifetime. After the meal, Pastor Ruben went forward and started to share. He then asked people in his congregation to come forward and speak. Several of them came forward and, along with them, several of our team members went forward. As they were sharing what our coming meant to them, we were able to say over and over again what they had taught us, how our lives will forever be changed because of their love, their faith, their trust in the dreams God had planted in their hearts. They are such inspiring, loving, wonderful people and hearing their hearts for the Lord, and for us as brothers and sisters in the Lord, is beyond beautiful. There were several moments that stood out to us. One precious man from the church stated that, the story of faith that started for Pastor Ruben under that tree years ago didn’t end there. It kept going. That story of faith and the story of the Faro del Cielo church now has a chapter in it that includes the story of Lakeshore. He told us that the faith story of the Faro del Cielo church will forever have a piece of Lakeshore in it. That thought is so profound and beautiful. 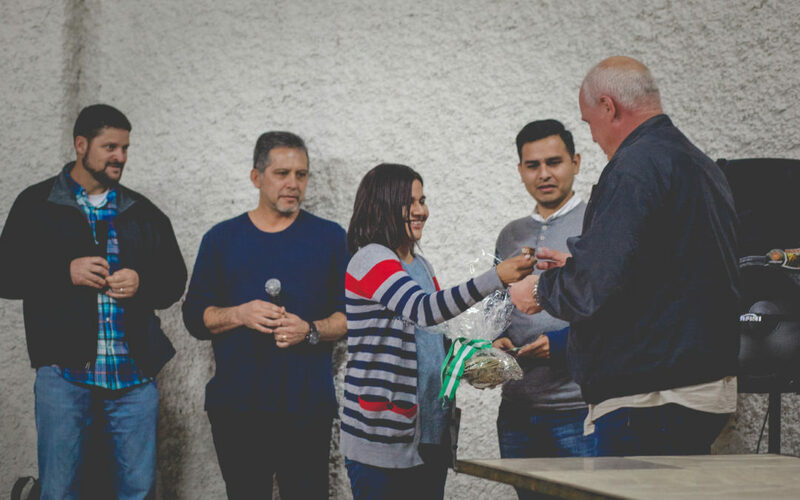 God has given Lakeshore such a place of honor in the story of faith that is the story of the Faro del Cielo church. One sweet moment came as two couples from the church came forward with the most precious of gifts. They had taken the shirt that Kisha had designed with the mango tree on it and had the picture of the mango tree beautifully carved into a piece of wood. Below the tree, they had pictures of Pastor Ruben and Pastor Isabelle and Pastor Bruno and Pastor Alejandra as well as the whole team from this year’s trip. At the top it had the words “Thank you for giving to the Lord” carved into the wood. They gave that precious gift to Pastor Gil as a remembrance of our time together. As he emotionally accepted the gift, he said what we were all feeling…that while the gift was lovely and the most generous of gestures, that it was not necessary. There is no possible way we could ever forget the people of the Faro del Cielo church. They are imprinted into our hearts and minds and they are not just friends but family in the Lord. It is amazing to watch each year as new team members walk into the church and meet these people. There is no delay. There is no adjustment time. There is no feeling of discomfort. The Holy Spirit works as only the Holy Spirit can and knits hearts together in an instant. There were those of us there last night who have been here four times. There were those of us who had only been here on one trip. It didn’t matter. There wasn’t a dry eye in the place. God makes family and confirms His heart again and again. There is an indescribable love and affection for these people that comes from the very heart of the Father. As they spoke of the love they felt for us, it was returned back to them filled up and running over with how much we love them. That is how God has worked over and over again here in Bolivia. The building project is fantastic. Seeing the progress on that building is remarkable. But the reason we love coming again and again is because of the family of God and the love that we share. If we just came for a building, the trips would lack substance but because of the connection given by the Holy Spirit, we leave each year grieving a little bit and longing to return. God loves these Bolivian people so very much. What a joy it is to get to be a part of His heart for this country. So, we wrap up another year here in Bolivia. We know that what we feel for these people doesn’t compare to how much God loves them and how much he is proud of their faith and their hearts to share the gospel. We miss them when we go but we know that the God of all peace will love them and hem them in on all sides until we see them again. As we again listen to Pastor Ruben’s heart to reach his entire country for Jesus and the God sized vision Pastor Ruben has to spread the gospel into every area of the world, we again marvel at the goodness of God and the honor He has bestowed on Lakeshore that we get to be a part of God reaching the people of Latin America for the Lord. Our scope at times can be so small but here, the goal is to reach the world for Jesus. When God chose Lakeshore to be a small part of this enormous calling, He whispered into our hearts, “Oh, Lakeshore, I love you so much. I’m going to gift you with the calling of a lifetime. Blessed are you among churches.” The plans of the Lord are perfect, friends. His love for us is beyond measure. There is no greater joy than to be in the center of His will. Thank you for the part you play in this God calling. You are important and the impact of these trips, of your prayers, of your giving will be revealed on day in heaven when we will see perfectly what we can only see in part today. What a day that will be! I can’t wait to share that with each one of you.